It should be noted that simulation of queuing networks, in particular, simulation of communication networks by means of cellular automata is a common approach [2, 3], at the same time, revealing self-similarity effects in the simplest model considered below allows to take a fresh view of the fractal nature of teletraffic. where is a certain rule that can be expressed, for example, in terms of the Boolean algebra, and is a set of neighbouring cells (neighbourhood). Each cell of the system of cellular automata that corresponds to a model of closed queuing network will be considered as a telephone subscriber. It is supposed that each subscriber at random time moments can give a telephone call only to his near acquaintances that correspond to eight cells from the subscriber’s neighbourhood, i.e. Moore’s neighbourhood is used  – the cell will have its cell neighbours: . The time distribution of calls to the nearest neighbours for each subscriber is exponential with parameter . If at the moment of call the addressee’s telephone is free, connection takes place and conversation occurs, the time of which also obeys the exponential distribution (with parameter ). If at the moment of call the addressee’s telephone is busy, the denial of service takes place. During the next cycle of cellular automata system the subscriber again makes an attempt to connect a random neighbour (not necessarily the same). If the subscriber’s telephone proves to be free (in standby state), while he was called, the standby time is over, and the telephone goes over to a busy state for the same period as the telephone of calling party. For visualization of the model (Fig. 1) the cells that are in “busy” state will become red (a darker colour), and free cells – blue (a lighter colour). Inside the cells there are figures shown – the number of cycles to service completion (positive number), and the number of cycles to next call (negative number). 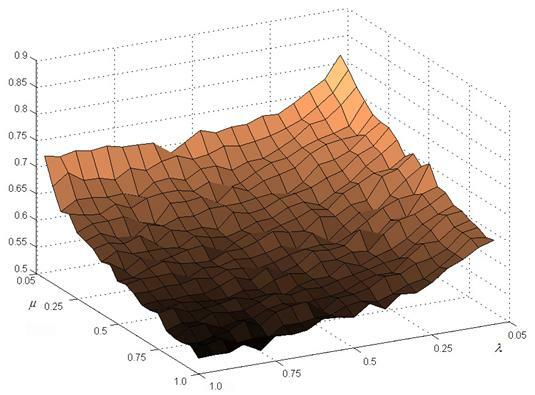 In the model presented there are three parameters that can vary – the size of cellular automata field, and . All examples are illustrated by a relatively small field – 15У15 cells, however, as investigations showed, the increase in field size has almost no effect on the model dynamics. 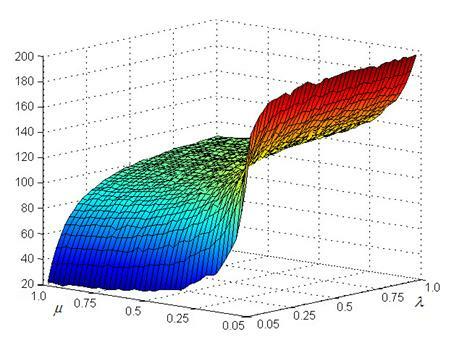 The output parameter of model is the number of cells that are in service, i.e. in “busy” state at current moment. 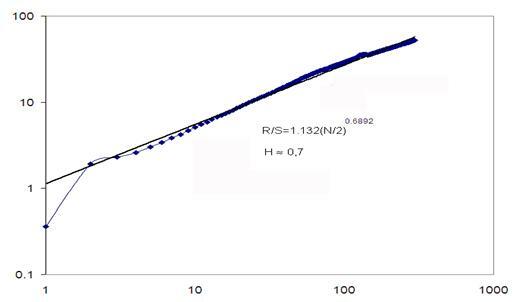 The dynamics of changes in the output parameters for the values =0.07 and =0.03 is shown in Fig. 2. It is obvious that at given output parameters the number of cells in service is constantly varied about some average value depending on these parameters. In so doing, the state of stabilization is not achieved, i.e. 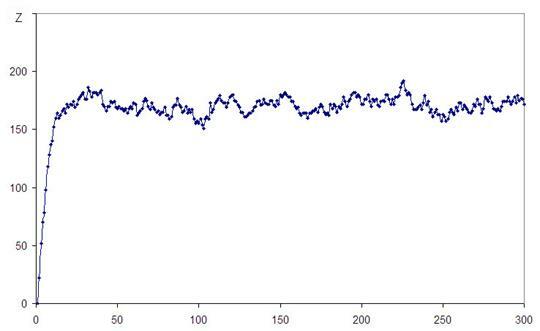 dispersion of the resulting series of observations does not tend to zero, moreover, it turned to be a constant value. where is a number of cells in service state, and is scaling constant depending on field size. J.Hurst experimentally discovered the following to be valid for temporal series possessing the property of self-similarity: , where is called the Hurst factor. The presence of this power dependence substantiates fractal properties of the temporal series. Fig. 4 shows a plot of versus cycle number in our investigated model for certain values of parameters and . The fact that this plot is well approximated by a straight line on a log-log scale gives grounds to suppose the presence of fractal properties in a model under consideration. The Hurst factor is known to be a measure of persistence, i.e. process disposition to trends. The value of H > ½ means that the process dynamics having certain direction in the past will most probably involve continued motion in the same direction. If H < ½, then it is predicted that the process will change its direction. H = ½ means uncertainty, for example, such value takes place for the Brownian motion. In the referred example the value of the Hurst factor is 0.69 (Fig. 4), which testifies to process persistence. However, not for all series of observations the Hurst factor proved to be so “convincing”; at some and values one could observe quite a chaotic behaviour of a series with the value of ½. Calculations were performed for different and values, in order to clear out the character of self-similarity of series. The data averaged already by 40 realizations (Fig. 5) testify to a stable regularity of change in the Hurst factor (the self-similarity level, respectively) as a function of and . The investigations performed explain the self-similarity of teletraffic in some data communication networks  (for certain and values ) on a simple and reproducible model, in particular, when the average standby time and connection duration is increased (in real systems it is first of all related to transfer of multimedia information), the Hurst factor grows, explaining the increased effect of teletraffic self-similarity in real networks . 1. Von Neumann J. Theory of self-reproducing automata, edited and completed by Arthur W. Burks. University of Illinois Press: Urbana, IL., 1966. – 388 p.
2. Yuan J., Mills K. Exploring Collective Dynamics in Communication Networks, Journal of Research of National Institute of Standards and Technology, 107, 179-191, 2002. 3. Maerivoet S., De Moor B. 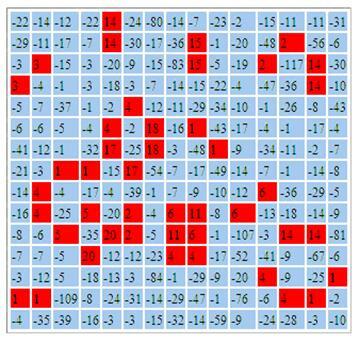 Dynamic Traffic Assignment Based on Cellular Automata // ESAT-SCD (SISTA) / TR 06-058, 21 p.
4. Moore E.F. Machine Models of Self-Reproduction, Proceedings of a Symposium on Applied Mathematics 14, 17, 1962, reprinted in Essay on Cellular Automata, edited by A.W. Burks (University of Illinois, Urbana, 1970), p. 187. 5. Feder J. Fractals. - New York, London: Plenum Press, 1988. - 288 p.
6. Crovella M.E., Bestavros A. Self-Similarity in World Wide Web Traffic: Evidence and Possible Causes. – IEEE/ACM Trans. on Networking, 1997, v. 5, № 6А П. 835-846. 7. Leland W.E., Taqqu M.S., Willinger W., Wilson D.V. On the Self-Similar Nature of Ethernet Traffic (Extended version). – IEEE/ACM Trans. on Networking, 1994, v. 2, № 1, p. 1-15.